Across the nation, there have been media reports of new schools that cause physical harm to occupants from the gassing off of new building materials and of old buildings with toxic mould, combustion leaks, and other indoor air quality deficiencies that contribute to poor health and lowered performance. A study by Honeywell in 1994, and more recent work by the US Environmental Protection Agency and others have found impacts on academic performance add to the health concerns for young people attending worn-out, poorly maintained and generally substandard school buildings. The size of the problem is only just being recognized, but in Nova Scotia and some other areas, resources are going into upgrading and replacing worn out schools in a manner that will contribute to better health and learning. A new approach is emerging – designing and building schools to attempt to ensure high quality indoor environments without breaking the budget. A new benchmark in this effort was opened in Halifax on January 8, 2003. The old Halifax West High School was closed in August of 2000 because the school had outlived its life span and had been causing significant health impacts on teachers and students for several years. CASLE’s work toward healthier schools, however, did not begin with Halifax West, nor has it stopped there. Since the early 1990’s CASLE has assisted schools, school boards and government departments to improve the indoor environments of existing school, and since 1997 CASLE has provided reports and information on many aspects of new “Healthy” school design and construction. Several new schools have been built, each one contributing more to the collected knowledge about design, construction and operation of Healthy Schools. The Nova Scotia Department of Education decided to use the construction of a new Halifax West to “raise the bar” in building schools that will be healthy buildings from the day they open, and remain healthy buildings for the long term. It struck a Healthy Schools Construction Committee to guide the process. Halifax West High School was a fast-tracked school. It took just under 2 years from the time it was announced to the time it was completed. With 1500 students, it is the largest school Nova Scotia has built in at least 30 years. While breaking new ground in healthy school design and construction, and with the extensive evaluation of construction methods and building materials which took place at every stage, the school was still built on time and below budget. In fact, the school was completed ahead of time, and left empty for six to eight weeks in order to allow the building and contents to off gas. The demonstration that healthy schools don’t have to cost more takes away one of the common arguments against modifying established building practices to accommodate health concerns. Most importantly, there were none of the usual health complaints that accompany most school openings, and the indoor air remains excellent to this day. What makes a Healthy School different? There are over 400 details. But for interest, here are thirty examples of healthy school building practices which were incorporated into the new Halifax West High School. Avoidance of occupant exposures to combustion fumes or fuel leaks. This is done either through design innovations and superior equipment for traditional heating/cooling systems, or by using alternative systems. This school has an innovative heat recovery system. The only fossil fuels burned on site are with the bunsen burners in the chemistry laboratories as no alternatives are available yet. Gym floor finished and gassed off for 8 weeks before occupancy, and using low emission products. This is a first in NS and possibly Canada, if not North America. Ventilation system exceeds American Society for Heating, Refrigeration and Air Conditioning Engineers (ASHRAE) Guidelines. Goal: Cleaner air indoors than outdoors (once gassing off is complete.) There is a huge filter system plus 100% fresh (unrecycled)air. New low-emission, surface-sealed desks and furniture were required from the furniture supplier. Ductwork was required to be delivered varsol/oil free and stored clean on site. Ducts were well sealed daily during construction to keep dirt out, and the system was left off until final cleanup was finished. Careful attention was paid to orientation of air intakes to avoid sucking used or polluted air into the school. Parking lots situated downwind (prevailing winds) and 50 ft. from the building. Ventilated halls to insure clean out of “dead” air in halls, as well as from locker contents which can be concentrated sources of pollutants. The chemistry labs have a special ventilation system for use with Bunsen burners and in case of chemical spills. New locker design has lockers off the floor for ease of cleaning and to prevent build-up of mould-producing dirt under them over time. All classrooms have operable windows and screens except drama (stage area). Clear glazing in windows. Window orientation and shading provide pleasant brightness and prevent overheating during hot afternoons. Broad spectrum fluorescent lighting complements natural light for health, performance and comfort. No CCA pressure treated wood (PTW) anywhere it could come in contact with skin. Special care was taken in disposal of PTW sawdust and other toxic materials such as solvents. Minimal use of fabrics and other fleecy materials, including no carpeting. There are no plastic garbage cans, since pranksters occasionally set fires in garbage cans. Several teachers in Nova Scotia breathed toxic fumes from this in the past. Photocopy rooms are isolated and have separate ventilation. Easy access for maintenance and cleaning. In this school, maintenance was given priority. Heavy ceiling tiles minimize particle abrasion. The edges of ceiling tiles were not sealed, but they seem to have gassed off quickly. Controls for electromagnetic field (EMF) exposure from computers in the computer rooms, and also wiring and electrical areas located to minimize EMF exposure to occupants. No indoor plants or water fountains (to reduce mould potential). Water coolers are lead and plastic-free. An extensive radon system was installed, including mechanical exhaust of the foundation. Kitchens and kitchen equipment are mainly stainless steel. Care taken not to allow sawdust or garbage to fall between walls or into block walls. (One new school had to have a wall dismantled because of rotting odours from this problem.) A special inspection was added to ensure no debris was left above the ceiling T-bars. No pesticides were used during or after landscaping. Least toxic cleaning materials were used during construction and at final cleanup. The on-site inspector and construction heads were trained in healthy school construction issues. They in turn explained the goals to workers. 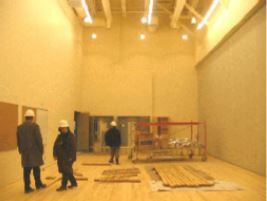 For example, during construction, wet, damaged or unspecified materials were turned away. Training of building operators. Training of the maintenance personnel was video taped for future use, for example, for refreshment sessions or if there is staff turnover. An extensive offgassing “flush-out” period of six to eight weeks, with cabinets open, furniture and equipment, including new computers, gassing off with ventilation on around the clock. Extensive preoccupancy testing and evaluation using residential rather than industry standards for indoor air quality. This list just skims this subject of Healthy School design and construction. Maintenance and operation are equally important to creating long term success. In addition, much was done to make this school also a “green” school. For example, the well-designed garbage recycling system includes a recycling room with floor drain for hosing down, and with almost no fossil fuel consumption, the school helps meet Canada’s Kyoto commitments. The health benefits to students and staff in Nova Scotia’s schools have not stopped at the doors of Halifax West. Most of the innovations incorporated into this school are part of the Design Requirements Manual, a provincial government document which establishes building standards for all public buildings in Nova Scotia, and it continues to be upgraded with the newer schools. Epi-pens are reported to be virtually unused in these new buildings. Many teachers who experienced health problems in their schools have been transferred to the Healthy Schools and they report feeling as energetic at workday’s end as they feel when the days begin. 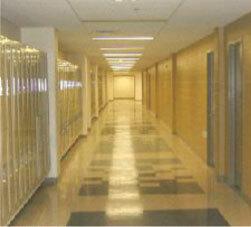 For more information on Healthy School Design and Construction, visit www.casle.ca.